There was a full house for the JVAC club match fished on the Cedar Pool at Decoy Lakes which saw in-form Chris Saunders top a strong field. He finished with 124lb 3oz, all taken close in on meat from peg five. In the runner-up spot was Andy Gausden. He caught on the long pole with pellet to start with but the strong wind saw him resort to a close-in approach on red maggot which in fact worked out well for him as he put 112lb 11oz to the scales. Gausden was also crowned the club Knockout Trophy winner beating Ernie Lowbridge to the title. Third place went to Lee Kendal with 97lb 3oz - another angler fishing the short pole with red maggot - followed by Will Hadley on 95lb 13oz. The Friday Over 55s match at Decoy Lakes is proving to be very popular at present. 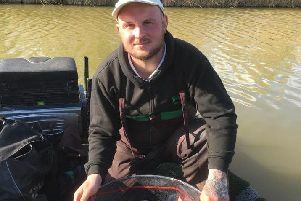 In the latest match fished on the Yew Pool it was Saunders again who came out on top. This time he put 145lb 12oz to the scales from peg seven catching close in with meat. In second place was Roy Whincup, who also caught on a short pole line, but used red maggot. Third place went to Vince Hull with 124lb 5oz. Over on the Willows, there was a comfortable victory for Paul Faulkner from peg 20 in the Hotpoint AC match. He caught the majority of his fish on a small feeder fished tight over to the island. In second place from peg 35 was Kevin Larner, who fished the feeder and also the pole in the margins for 71lb 15oz. Third with 61lb 12oz was Pete Sayers, who made the frame for the first time since joining the club. Six Islands at Decoy was the venue for the Conservative Club match and showed some good early-summer form. Leading the way from peg three was Tony Ruddy. He caught on a small feeder around his platform in the margins on a bunch of red maggot to weigh in108lb 6oz. Second on peg six was Andrew Porter, who caught well all day on sweetcorn over a bed of micro pellet for 94lb 8oz. John Parnell took third place. He also fished sweetcorn from peg seven, putting 92lb 8oz to the scales. The Yew Lake at Decoy is certainly living up to its reputation for big fish and big weights in recent weeks. In the Ramsey AS club match on Sunday there was close to 1,800lb of fish taken. Top rod was Josh Pace, who put a massive 200lb 11oz to the scales. He caught on a bomb and pellet approach catching carp to double figures from peg 16. Not far behind was Andrew Wilding, who fished the feeder and short pole line for 196lb 8oz, then came Rob Wright with 141lb 8oz and Roy Whincup with 128lb 4oz.